SOME of the best iron in the world comes from Sweden. One of the most important iron ore districts of Sweden - the Norrbotten District - lies in the wild fastnesses of Lapland, beyond the Arctic Circle. The existence of the great Lapland ore fields was well known generations ago, but the iron workable in those parts had a high content of phosphorus, which made it useless in the smelting methods used in days gone by. Lapland ore consists of magnetite (magnetic oxide of iron), and has an iron content of 60 to 65 per cent, this varying according to the amount of phosphorus in the ore. The greater the phosphorus percentage, the less is that of iron. Iron to-day dominates the region that stretches in an attenuated form from the Gulf of Bothnia in Sweden to the coast of the North Atlantic at Narvik, in Norway. Once that district was remote and un-penetrated, as was the Hudson Bay area in Canada. To-day, electric trains run across and through the mountains, and men have built busy industrial towns in the middle of the primeval forest. Iron was the sole reason for these developments. Away from the beaten track - that is, the iron ore districts and their traffic artery - Lapland is still virgin country. Though the smelting and conversion to steel are not carried on in the Norrbotten District, the Basic Bessemer process was the immediate cause of the development of that district. In his original process, Sir Henry Bessemer was obliged to avoid using phosphoric iron because it was unsuitable for his original converters. In 1878 the engineers Thomas and Gilchrist, faced with this disability of the Bessemer process, conceived the idea of lining the furnaces or converters with magnesia and lime where phosphoric iron was to be treated. They bonded the mixture together with tar, or similar material containing but little silica, and added lime to the metal during the blowing process. The magnesian limestone mixture absorbs phosphorus out of the molten iron as long as oxidization is continued, as, for example, by the frequent addition of ore containing iron oxide. Thus the introducers of the Basic Bessemer process assured the future of the Lapland ore fields. The ‘eighties of the last century saw the first developments in the opening up of the Lapland iron ore district. Close to Gallivare, nearly fifty miles north of the Arctic Circle, rose the great Malmberg, 2,026 feet high and described as a “solid mountain of iron”. “Reef” would, perhaps, be a more correct term, though the name Malmberg means “iron mountain”. This huge reef, between three and four miles in length, consists chiefly of bright specular iron (crystalline sesquioxide of iron) mixed with magnetic oxide of iron. The Malmberg, however, could not be worked without means for carrying the ore away to the sea for shipment. Of roads in Lapland there were none worth the name. None of the country’s huge rivers, with their rapids and falls, could support shipping, and iron ore could not. be carried down these swift rivers in the same way as timber. It became necessary to build a railway through surroundings and into latitudes where the locomotive had never before been imagined. In 1887 work was begun by British engineers on the railway from Lulea, on the Gulf of Bothnia, to Gallivare and Malmberg. This line was owned by the North Europe Railway Company and was promoted by capitalists in England. To-day the railway, with its more recent extensions, is owned and worked by the Swedish Government. The railway to the Gallivare area was opened in 1888, and with its inauguration the mining engineers were able to make a beginning. After the start made at Gallivare, the prospectors pushed on, still farther north, to the great ore reefs known as Kiirunavaara and Luossavaara. To reach these reefs the engineers had to carry their line more than 100 miles north of the Arctic Circle. They penetrated virgin forest and bare mountain-side until they reached the reefs. The main reef, Kiirunavaara, appears from a distance as a serrated mountain ridge and has a length of nearly five miles. The Luossavaara reef, besides being considerably smaller, forms the summit of a rounded hill. The three reefs already mentioned are estimated to contain at least a billion and a half tons of ore in sight. It is probable that a great deal more remains for the prospector. In addition to these, there are lesser workings owned by the Swedish Government in Lapland at Svappavaara, Leveaniemi, Ekstromsberg and Mertainen. Dr. Hjalmar Lundbohm was the father of the Kiirunavaara workings and of the modern township of Kiruna which has sprung up beside them out of the northern waste. He saw his projects realized in the early years of the present century and to-day the community virtually founded by him is the largest in the whole of the Norrbotten District. In this district the mining engineers use the “open cut” syst em in attacking the great reefs at the Gallivare and Kiruna centres. This means that they quarry out the sides of the reef in terraces, or “benches”, as they are called, so that the mountain looks as if it has been cut into a series of enormous steps. The miners bore the face of the mountain with powerful rock drills and insert their charges. When a blasting operation is about to take place a siren is sounded and an observer sees figures on the face of the workings beginning to move away from the critical place. Again the siren sounds, a third time and a fourth. Finally another siren, with a deeper pitch, sends forth a long-drawn note as a last warning. Then the man responsible fires his charge. There is heard the deep, thudding volley of the charges, followed by the crash of falling rock. ONE OF THE STEEL PYLONS which carry the transmission fines of the Iron Ore Railway across 316 miles of bleak fells and deserted forests. Power is generated at Porjus, in Sweden, and transmitted at a pressure of 80,000 volts to the fifteen sub-stations, where it is stepped down to 16,000 volts. In adopting the open-cut system, the engineers had to evolve means of getting the ore quickly and easily away from the working face and into the trains which carry it off for export. This was done by making “glory holes”, as they are called in English-speaking countries. At ground level the men pierce the face of the mountain with a series of railway tunnels, each terminating in a dead end. This dead end contains a spacious ore bunker, from which the excavators bore what is known as a “raise”, straight upwards through the rock until they break ground on the surface of the bench overhead. The upper end of the raise they widen out in a funnel formation, so that the glory hole acts as a huge chute, with a hopper at the top. The miners clear away the ore from the face of the cliff and pass it into huge crushers which reduce the pieces of ore to a size suitable for shooting down the glory hole. Small tram-roads assist in carrying mat erial on the benches and huge power-driven shovels do the lifting and dumping. This entire operation of blasting, crushing and transporting to the tops of the raises is known as milling. While the milling is going on up above, the men at work in the bunkers down below are busy. As the ore falls into the bunkers, it is held back by strong gates, from which the loaders draw it off, finally shooting it into the waiting railway wagons in the tunnel. 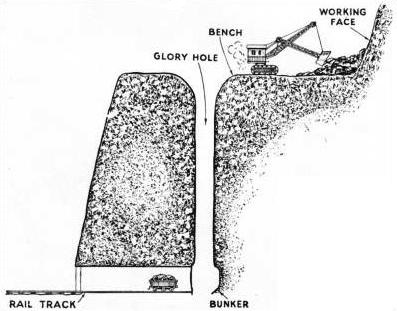 THE GLORY HOLE of an open iron ore mine is shown in this sectional diagram. The glory hole is a chute or funnel-shaped shaft, leading from the working face to a bunker at the end of a tunnel along which railway trucks remove the ore. The open cut system of mining is a method of some antiquity. Miners knew it long before they knew the deep shaft, the high-speed winding engine or galleries situated about a mile below the surface of the earth. In Germany all classes of mining are known as Bergwerk, or “mountain working” and, on considering the open cut system, we see how the early mining engineers came to use this term. When the first pioneers came to the Lapland ore fields, they saw that the open cut system would be the one to employ on the vast reefs round Gallivare and Kiruna. Where it can be practised the system eliminates many difficulties with which the builders of underground workings have to contend. The open benches cannot be flooded nor can they catch fire. The dangers from falling rock, though they exist, are far less than in the vast systems of underground galleries common in Great Britain and elsewhere. The ore is on the surface, waiting to be taken away. When the old North Europe Railway Company began work on its first section between Gallivare and the coast, it had a relatively easy task before it. Sweden has a generally easy slope down towards the Baltic and the Gulf of Bothnia from the central Scandinavian mountain chain, which divides the country from Norway on the west. THE DAM ACROSS THE GREAT LULEA RIVER, where it flows out of the Suorva Lakes, in north-west Sweden, is 4,115 feet long and 42 feet high. The dam had to be specially strengthened to resist the pressure of the ice brought down the river in winter. Water for driving the turbines in the generating stations is drawn through a tunnel bored through the solid rock. Power is transmitted to the Iron Ore Railway by overhead conductors. In carrying their line up from the coast, the railway engineers took a fairly straight slant across this gradual inclination. The gradients were relatively easy and the engineers encountered none of the difficulties that were keeping their colleagues at bay in Norway. After a time, however, the private company gave place to Swedish Government interests. The great disadvantage of this first outlet from the Lapland ore fields was that for a good part of the year it could not be used at all. The railway was workable in winter, but the Gulf of Bothnia was not navigable because of thick ice. The Baltic ports, being virtually tideless as well as unaffected by the Gulf Stream, freeze over rapidly in winter. Thus throughout the cold months the ore workings and their traffic artery had to stand idle. There was nothing for the engineers to do but to push on over the mountains until they had a through line connecting the mines with the ice-free coast of Norway, where the North Atlantic merges into the Arctic Ocean. This involved much difficult work. From Kiruna the engineers had to take their line straight into the mountains, across the Rautas Valley, until they reached Nakerivara, at the foot of the great mountain lake called Torne Trask, the source of the wild Torne River. Then they skirted Torne Trask along its southern shore until they came to its head. Beyond the lake they had to cut straight across the watershed into Norway and drop the line down to the shores of the Ofot Fjord. They placed their final railhead at Narvik on the fjord, after having crossed a summit-level of some 2,000 feet. In addition to all the usual difficulties experienced by those who build a railway across a great and wild mountain range, the engineers had to face all the rigours of the Arctic winter. 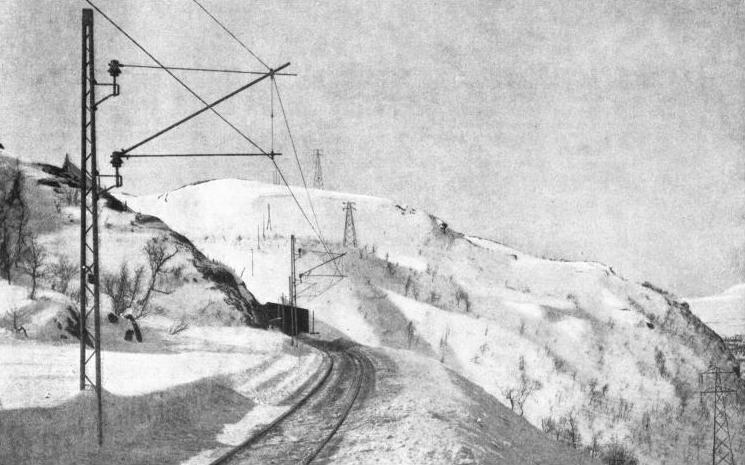 They had not only to blast a path for their steel track, but they had also to place that track in such a way as to make it as invulnerable as possible from snow-slides during early spring. In the normal course of events, tunnels would be particular sufferers from these natural disabilities. For protection the builders of the Ore Railway built huge snowsheds which projected from the tunnel portals. To give double security, they set stout fences, and in some places thick walls of masonry, terrace fashion, up the hillside above the danger spots to arrest the force of avalanche or snowslide. The wild shores of Torne Trask, where the line flanked them in a particularly exposed position, were the scenes of similar precautions. ACROSS THE ARCTIC CIRCLE to Narvik, on the Ofot Fjord, Norway, the Iron Ore Railway affords a direct outlet from the iron ore districts of Lapland at all times of the year. The railway was built from Lulea, on the Gulf of Bothnia, and work began in 1887. In the beginning of the present century the railway engineers completed their line over the great Lapland mountains, by dint of superhuman work with rock drill and blasting charge. The year 1902 saw the first, ore trains running through from Kiruna to Narvik. The Lapland iron industry was independent of the Lapland winter at last. But the opening of the through railway line did not solve the problems of the engineers responsible for the transport of the ore. Their walls, giant fences and snowsheds might ward off the devastating effects of sliding snow, but they had still the drifting snow to contend with. At first they adopted the same methods as are used in Great Britain on the exposed lines of the Scottish High-lands and on the Pennines. A locomotive would have a great prow-shaped plough built up over its buffers and smokebox; two others would be coupled up behind, and the three, thus armoured, would be sent at speed into the drifts. This method worked fairly well, but there was always an element of danger in it and it could scarcely be described as scientific. One day in the winter of 1904 a plough, thus driven by three locomotives, met with such resistance that all were thrown off the track. Because of this accident, the Mechanical Engineer’s Department of the Swedish State Railways decided that the only way to deal with such a climate as that of Lapland was to adopt the rotary type of plough. Briefly, this consists of a huge multi-bladed wheel or rotor, with a central cutting boss, mounted on the front of a special railway van and turned by a powerful engine inside the van. With this appliance, those responsible for keeping the track clear are able to screw their way through the drifts instead of forcing through them. As the rotor turns, it automatically shoots the waste snow out at one side of the stout steel hood that covers it. The entire snow plough is propelled by an ordinary locomotive coupled up behind it. The ploughs, originally steam-driven, are to-day electrically operated. The Swedish State Railways’ engineers were the first to apply electricity as a motive power for snow ploughs. AT A DEPTH OF 160 FEET below the surface of the ground is the dynamo room of the Porjus Power Station. In this hall, 230 feet long and 33 feet high, the temperature is 50° Fahr. when there are 72 degrees of frost above. 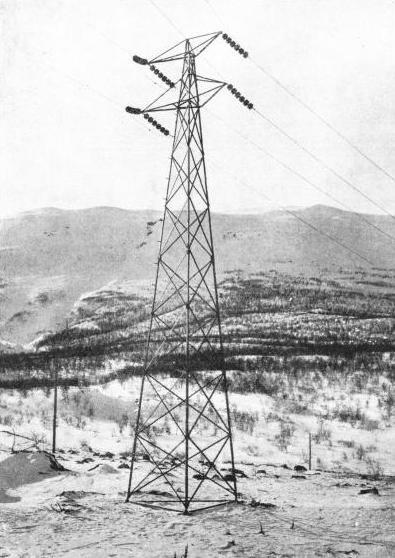 Power from this station is supplied to the Iron Ore Railway and to the iron ore fields and works in the Norrbotten District. The original motive power of the Iron Ore Railway was steam. From the first, the Operating Department found that steam had its limitations. The steam locomotive is not an ideal form of power in exceptionally cold climates, and the winter temperature in the mountains of Lapland is often round about zero Fahrenheit. The engines, too, were of only moderate power, and at first it was normal for three to be requisitioned for hauling one ore train over the mountains, a wasteful and costly process, particularly in a country such as Sweden, which has few coalfields and has to import her fuel. 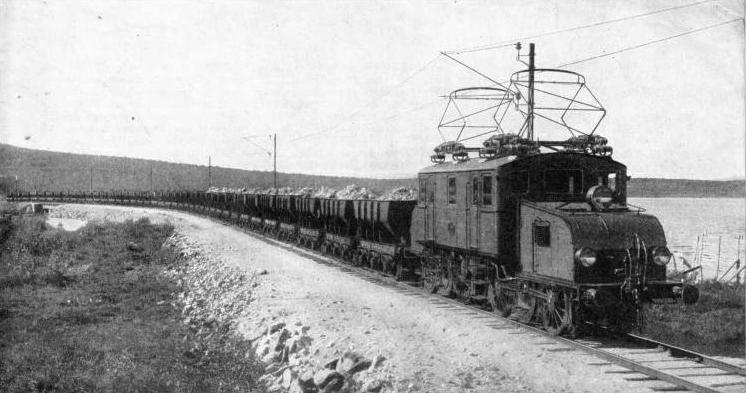 Large engines were built in an attempt to reduce piloting and its attendant costs, but shortly before the war of 1914—18 the engineers of the Swedish State Railways decided that electrification would provide the solution of their traction troubles. Even this was not without its difficulties. They could not use conductor rails, which are most susceptible to the effects of ice and snow. Having studied methods which were then being adopted in the Alpine countries, they decided to use the single-phase system, feeding current to overhead contact wires at 16,000 volts, 15 cycles. For the source of their energy they chose the Great Lulea River, near where it flows out of the Suorva Lakes on the first stage of its journey down to the coast at Lulea. They placed the hydro-electric power station at Porjus. As a protection against climatic conditions the machinery was installed in a hall 160 feet below ground. Porjus Power Station contains six single-phase generators for traction and power, one being held in reserve. The energy is generated at 4,000 volts, 15 cycles, but the transformers feed it to the overhead transmission lines at a pressure of 80,000 volts. Two main transmission lines radiate from Porjus to the fifteen sub-stations, where the current is stepped down to its final pressure of 16,000 volts. Of these lines one runs northwards and forks, sending branches to Kiruna and Tarendo, and the other southwards to the Gulf of Bothnia. AN IRON ORE TRAIN on the Lulea-Narvik railway. Ore from the prolific fields of Malmberget (the “iron mountain”), Kiirunavaara, Luossavaara and other workings in the Norrbotten district is transported by this railway for shipment either at Narvik, in Norway, or at Lulea, on the Gulf of Bothnia, the northern arm of the Baltic Sea. Altogether these transmission lines, with their gaunt steel pylons straddling the bleak fells and deserted forests, cover upwards of 316 route miles. The sub-stations are situated at intervals of twenty miles from one another. 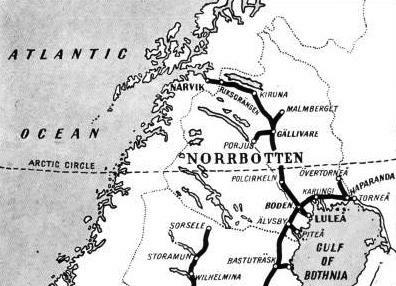 By June 14, 1923, electric traction was in operation throughout between the Gulf of Bothnia and the North Atlantic coast at Narvik. Since that date the whole of the traction on the Ore Railway, and all the machinery used in connexion with the workings at Gallivare and Kiruna, have been operated by energy drawn from the fall of the Lapland rivers. Nature, the old enemy, was thus tamed by the engineers into becoming the prime mover. To regulate the flow out of the Suorva Lakes, feeding the works at Porjus and Harspranget, experts sent into the North by the Government decided to throw a dam or barrage across the Great Lulea River at a point near where it leaves the Lakes at the beginning of its downward course. Their preliminary work began in 1919, and they undertook it at a point near the head of the river where it was divided into two channels. Across the western channel they built a dam with no outlet. 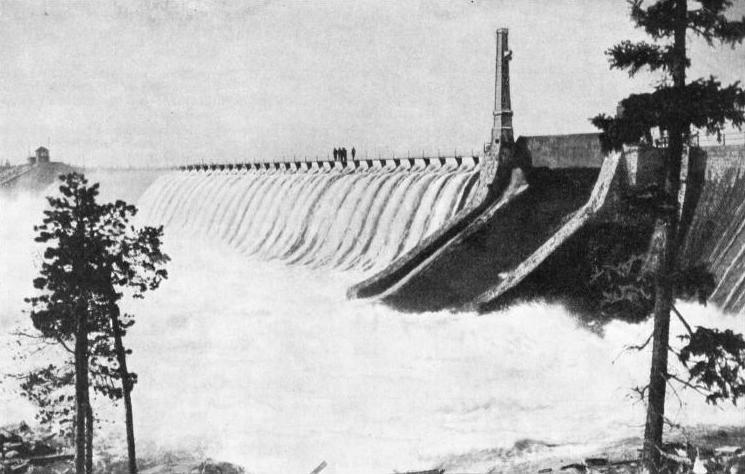 For the eastern channel they provided two tunnels passing under a dam equal in height to the western dam, the water being headed up 343 feet. The tunnels are not incorporated in the dam itself, for the builders bored them through the solid rock underneath. One of the tunnels is sufficient to regulate the flow, the other being provided as a stand-by. The ice formations in the Lapland rivers presented a formidable problem to the builders of dams and hydro electric installations. They had particular trouble in rapids situated above power plants. “Anchor ice” formed on the boulders at the bottom of the stream. In due course this ice became loosened, was carried down and formed dangerous jams. Moreover, the agitation of the water in the rapids caused it to be additionally exposed to the cold air above and to form ice needles. These ice needles, as they accumulated, resolved themselves into troublesome ice sludge, which was aggravated by the presence of snow blown into the current from the banks. At the generating stations, too, those responsible found themselves facing serious difficulties from ice. The turbines, being built on an enormous scale, suffer little from ice sludge, but the screens covering the turbine intakes became clogged with it. The engineers adopted two methods. One consisted of heating the screens by electricity, thus thawing out the sludge as fast as it adhered. In other instances they removed the screens altogether. At the sluices the ice at first tended to choke the rolling sluice gates and to pack up in the intakes. The experts overcame these troubles by electrically heating the gates, as they had the turbine screens, and by providing a kind of wooden flooring for the intakes, under which they drew hot air from the generating house. The Suorva Dams are situated some distance above Porjus. This is the nearest point on the railway, and there was no road, the only means of surface communication being by boats on the navigable parts of the Great Lulea, and by sledge in winter. Yet there the Swedish engineers set up their two great dams, building them of the native stone. Aircraft has solved one problem of communication, the aeroplanes being mounted on floats in summer, when they alight on the calmer water of the Great Lulea, In winter ordinary land aeroplanes are in use, these having skis substituted for the usual undercarriage. At Narvik, the Ore Company has its great quays and loading appliances on the shores of the Ofot Fjord, a vast, weird sea loch running in among precipitous mountains. Alongside the quays may be seen steamers waiting to carry the ore away to all parts of the world. A representative example of an iron ore steamer is the Sir Ernest Cassel, of 7,739 tons gross. In appearance she resembles a huge collier, with the engine-room and cabins right aft, a small navigating bridge amidships, and most of her space given over to holds. PORJUS POWER STATION supplies electric power not only to the Iron Ore Railway, but also to many of the iron ore workings in Lapland. Water for driving the turbines comes from the Suorva Lakes. 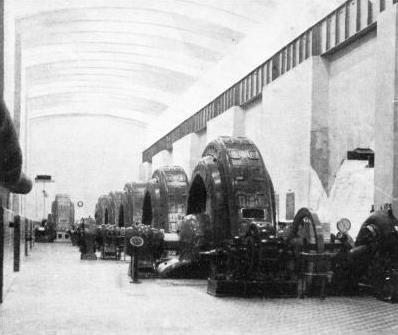 Six single-phase generators are installed for traction and power.